You can blame the Internet, Game of Thrones, or just our increasingly overloaded schedules. But no matter how you chose to slice it, there’s no doubt that procrastination has become a staple of our modern professional and personal lives. Hold up for a second though, and consider this: Is procrastination, especially in some of its more reflective forms, really all that bad? Read on for seven surprising ways a little “positive procrastination” can actually boost your time management skills, increase your business insight, impact your decision-making processes for the better, and more. Believe it or not, there’s a whole body of social science devoted to the idea of “positive procrastination,” a term used by Dr. Piers Steel, who posits that fully 95 percent of the population procrastinates at some point. In short, his theory argues that people who feel a sense of guilt about their procrastination often end up being more productive with the other tasks on their to-do lists (as they studiously avoid the major project). So, how does this play out in practice? Consider coming up with a “procrastination list” that you can work on when you’re actively avoiding another task. Then get yourself back on track with a sense of productivity from checking off a few of those minor items before tackling the big one. Author Frank Partnoy, author of the book Wait: The Art and Science of Delay, makes a good case in Smithsonian.com for why delayed decisions are actually sounder decisions. For example, he considers the snap decisions made by some in the banking industry as the ultimate cause of the financial crisis of 2008, and offers this advice for people tasked with anything from responding to an email to making an important business decision: “Just take a breath. Take more pauses. Stare off into the distance. Ask yourself the first question of this two-step process: What is the maximum amount of time I have available to respond?” Partnoy still urges individuals to actively make their deadlines, but says that allowing yourself the maximum wiggle room possible will make your decisions stronger in the end. Remember Adam Grant from above? Another cool highlight from his TED Talk was his focus on the difference in success factors between “first mover” concepts (for example, the early social network site Friendster) and ideas from improvers (like the late-to-the-party and now ubiquitous social platform Facebook). Grant notes that in a classic study of product creation, “the first movers had a failure rate of 47 percent, compared with only 8 percent for the improvers.” In other words, your first idea isn’t always your best. Procrastination could just help you and your team sift through some seriously mediocre nuggets, before uncovering the true gems later. So, reading this article on positive procrastination is all well and good — heck, you might even be positively procrastinating right now! — but when push comes to shove and a deadline is looming, procrastinators who don’t want to crash and burn are ultimately willing to try anything to get the job done. Enter the Pomodoro technique, a time-management tool that’s been used for decades. It’s appeal to procrastinators is obvious — the program involves spending just 25 minutes of sustained attention on a project before taking break. Pomodoro allows you to build in a little procrastination into your work session, while still getting your work done in the end. Plus, there’s nothing like a ticking clock to give you the motivation you need to kick your time-management technique in the pants. 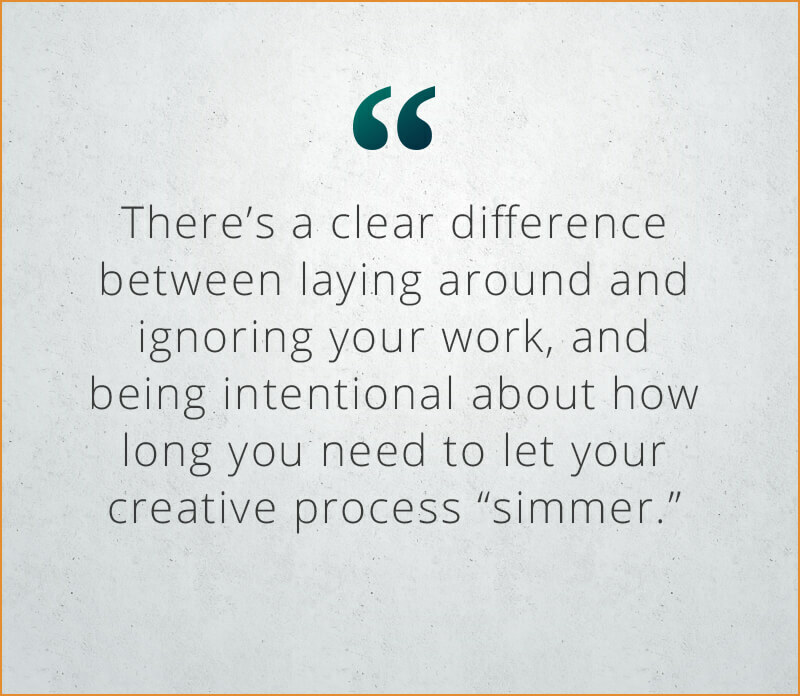 When you’ve taken all the time you can to let your ideas marinate, and your deadline looms before you, you’re not going to have time left to do everything “just right.” Here’s a novel concept: So what? Procrastination is a great way to stop letting “perfect be the enemy of good.” Now, we’re certainly not advocating for sloppy work here. But the bottom line is that your time is better spent completing a project to satisfaction than torturing yourself over the most minute details (and as a result never actually completing the project at all). There’s nothing like a looming deadline to get you to put the kibosh on things you know impair your workplace focus. It could be the instigator for your ignoring your email, putting your ringer on silent, and politely asking your colleagues not to interrupt you until your project is complete. Pay attention to how it feels to really concentrate on a single task. Then consider integrating stretches of uninterrupted time into your regular workweek. With a little practice, you might end up with more real estate to daydream — er, positively procrastinate, than ever before. Have time-management tips or tales from the front about how a little procrastination helped you be more productive? Reach out to us on our Twitter, Facebook, and LinkedIn feeds.